Floating Docks and Waterfront access require specialized knowledge regarding the unique conditions. Northwest weather provides some of the most challenging conditions possible for floating structures. With an Ocean Engineer on staff, we are able to review site conditions, estimate wave and wind conditions and plan site-specific dock solutions to meet both your need and budget. We also have excellent working relationships with the premier dock builders in the Northwest and can assist them in solving your floating dock needs. Permitting docks and marinas is equally challenging. It requires a careful balance of expertise and diplomacy. We have a demonstrated resume of delivering permits for all forms of in-water work. We develop innovative solutions and work with the agencies to develop solutions that meet both your need and their requirements. Andrew was the lead engineer on this national award winning park. He developed the innovative self-adjusting float concept, allowing this transportation facility to meet ADA requirements, and the curved concept meeting architectural goals. 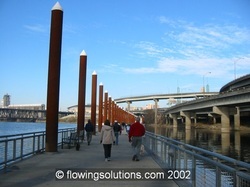 The Eastbank Esplanade includes 1000 feet of floating walkway, innovative bioengineering, two public docks, festival plaza and other amenities. 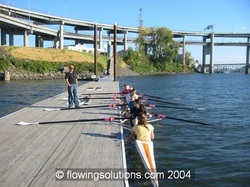 This light watercraft access dock was custom designed to meet the needs of paddlers and crew shells. The need for no piling obstructions on the deck necessitated an innovative anchor system which utilized Sea-flex, an flexible mooring system. 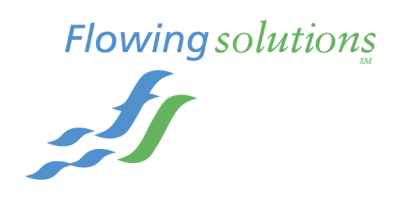 Flowing Solutions obtained the COE/DSL permit as well as completing design and construction administration.